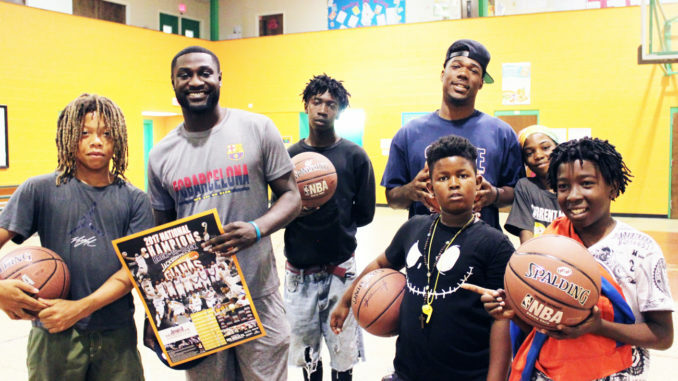 Shown is Jacksonville native Tyrell Johnson, overseas player for El Salvador LMB and Jacksonville Giant basketball player Keith McDougal shooting the hoops with Eureka Gardens student residents. 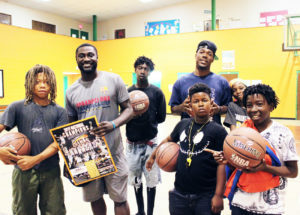 The Wayman Academy Hoops for Hope Program held its first public event this past Saturday on the grounds of Wayman Ministries in the Wayman Academy gymnasium. The Giant Jam and Spring Festival were front and center on the court from morning to mid afternoon shooting the hoops. The atmosphere was filled with music, food, kids’ activities and having a good time. Participating children had the opportunity to play basketball and meet Jacksonville Giant basketball player Keith McDougal, and Jacksonville native Tyrell Johnson who is an overseas player for the El Salvador LMB. The kids competed on the court to win several Giants’ basketballs, autographed posters, and other prizes. 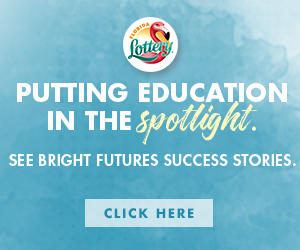 Additionally, information stations provided literature on summer camp, mentoring and mental health programs as well as Wayman Academy of the Arts enrollment.